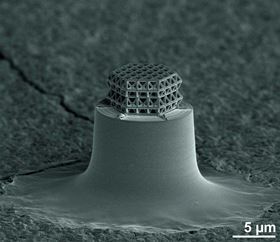 The world’s smallest lattice is around 10µm wide, with struts and braces just 200nm in diameter. Image: J. Bauer/KIT. In a paper in Nature Materials, scientists from the Karlsruhe Institute of Technology (KIT) in Germany report the smallest lattice structure made by man. The struts and braces of this lattice structure are made of glassy carbon and are less than 1µm long and just 200nm in diameter, making them smaller than the features on comparable metamaterials by a factor of five. These small dimensions provide the lattice structure with unprecedented ratios of strength to density; possible applications include as electrodes, filters or optical components. "Lightweight construction materials, such as bones and wood, are found everywhere in nature," says Jens Bauer, the first author of the study. "They have a high load-bearing capacity and small weight, and hence serve as models for mechanical metamaterials for technical applications." Metamaterials are materials possessing microscopic structures that confer mechanical or optical properties not found in unstructured solids. Examples are invisibility cloaks that can guide light, sound or heat around objects, materials that counterintuitively react to pressure and shear (auxetic materials), or lightweight nanomaterials of high specific stability (force per unit area and density). The current lattice structure was initially produced by the established fabrication technique of 3D laser lithography, in which the desired micrometer-scale structure is hardened in a photoresist by laser beams in a computer-controlled manner. However, the resolution of this process is limited, only able to produce struts as small as 5–10µm in length and 1µm in diameter. So in a subsequent step, Bauer and his colleagues used pyrolysis to shrink the structure. This involves exposing the structure to temperatures of around 900°C in a vacuum furnace, causing the chemical bonds to reorient themselves; this is the first time pyrolysis has been used to manufacture micro-structured lattices. The pyrolysis process causes all the elements apart from carbon to escape from the resist, with the resultant unordered carbon remaining in the shrunk lattice structure in the form of glassy carbon. This is a material that combines glassy, ceramic properties with graphite properties, and is of interest for use in battery electrodes and electrolysis systems. After fabricating this structure, the researchers tested its stability under pressure. "According to the results, load-bearing capacity of the lattice is very close to the theoretical limit and far above that of unstructured glassy carbon," says Oliver Kraft, co-author of the study. Until the end of last year, Kraft headed the Institute for Applied Materials at KIT; this year, he took over as KIT’s vice president for research. "Diamond is the only solid having a higher specific stability." Microstructured materials are often used for insulation or shock absorption, while open-pored materials can be used as filters in the chemical industry. Metamaterials can also have extraordinary optical properties that could prove of use in telecommunications.